By now, if you haven’t given up on reading these weekly emails, you know I’m a Mary Oliver addict. Just when I think I’ve run the gamut of all she has to offer, another one of her poems grabs me by the crown of my head and carries me away like an eagle. So here’s this one about–of course!–love. But for me it’s about the shape love takes in a person’s life, in what we sometimes call a vocation. Much of the time we bumble along, worrying about things that will never happen or over which we have no control. Which distracts us from “that unmistakable pounding – when you feel the mist on your mouth and sense ahead the embattlement, the long falls plunging and steaming.” Like a powerful waterfall, the kind of love we call a vocation can be overwhelming and frightening. But also fascinating. You want to run away, but it somehow lures you in, almost irresistibly. Have you ever experienced love, or your own calling, in this way? Do you agree with the strategy she recommends in the poem’s last lines? We are honored that Jobs with Justice, representing over 30 labor unions and community organizations, will join this week’s Mission Nightwalk. Wonderful to join our voices (and feet!) as people of faith with this great organization in delivering our simple, clear message: We care! Stop the violence!. Walking in style with our new Mission Nightwalk jackets! 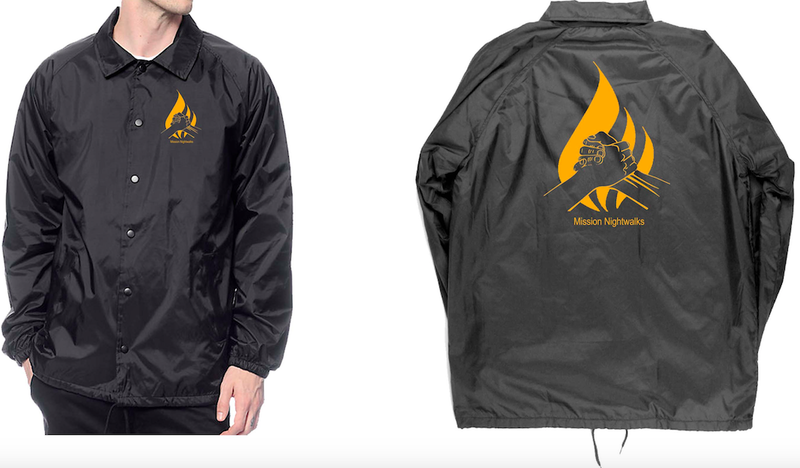 Our friends at HOMEY-SF and Native Graphix have just finished our new Mission Nightwalk jackets, and they look amazing! The jackets are nylon with a soft cotton lining, perfect for our walks the whole year around! You can either borrow one for a a particular Nightwalk, or have your very own for $15. This Sunday we welcome the leader of the San Francisco Muslim Center, Imam Abu Qadir Al-Amin. Imam Al-Amin received his first appointment as Imam in 1981, from the extraordinary leader of the Muslim American community, Imam W. Deen Mohammed, who was later referred to as America’s Imam after his passing. Imam Abu Qadir Al-Amin, studied extensively as a student of Imam W. Deen Mohammed for 33 years. In the tradition of Islamic teaching, the learned bestowed the authorization to teach on others who show promise in their Akhlaq (Character), their knowledge (Ilm), of the Qur’an and the life of Prophet Mohammed. Imam Al-Amin has served as Muslim Chaplain, Convener of Western Regional Imams’ (1995/2010). He has officiated approximately 300 weddings. In addition, he worked as Program Director & Associate Director of the Center on Juvenile & Criminal Justice from 1992/2013. Imam Al-Amin is apart of the SF Interfaith Council and is actively involved with faith based community organizing.He currently serves as Resident Imam of the SF Muslim Community Center in the Excelsior District of San Francisco and considers it a honor and a privilege to humbly serve the San Francisco Community. Imam Al-Amin is married to D. Hafsah Al-Amin they have four offspring, Qadir, Saidah, Bilal and Darisah, they have 5 grand children. This Sunday, our amazing Daniel Pickens-Jones heads to his sister’s wedding, and his Endersnight colleagues take a well-deserved break before the holiday season. Our monthly Compline resumes next month. This past weekend, many of us headed north to the Bishop’s Ranch for an unforgettable retreat filled with laughter, hiking through some of California’s most beautiful trails, great food, poetry writing, movie watching, art work, powerful conversation, lots of free time, naps, and, of course, much prayer. We weren’t the only ones praying out there! The Ranch has many treasures this time of year.